R&D Technology supply power conditioning systems for commercial and industrial installations on the east coast of Australia. Our power conditioners are designed to correct, manage and output a safe supply of DC and AC electricity in any environment. All power conditioning components and accessories are designed to meet the Australian standard for voltage requirements. Powerhouse Systems is an R&D Technology group company who specialise in power protection systems. For over 22 years, Powerhouse Systems has refined their product range and supplied power systems engineering for the diverse Australian workforce. AT R&D Technology, you get more from us than quality products at the best prices. The R&D team are experts in power protection systems and electrical utilities. Our technicians keep your business running with reliable technical support, onsite repairs and breakdown protection. Power factor is a measure of how effective your incoming power is for your electrical system. An Automatic Power Factor Correction System can improve the safety and efficiency of your power supply. This device monitors incoming power and corrects the ratio of reactive and real power, which reduces your business electricity bill and extends the life of your equipment. R&D Technology DC power systems supply power to essential machinery running – even during total power loss. Our DC power systems are ideal for delivering a safe supply of power to commercial and industrial settings. Common uses for DC power systems are powering LV & HV switchboards, DC substations, emergency power and lighting, and switch tripping. Sudden power loss can cost your business a fortune and put the safety of staff and customers at risk. We provide power backup solutions that keep essential lighting and devices running. Our devices can minimise fluctuations in input voltage to prevent overloading. And indicate changes in status with clear, audible alarms. Contact us for more information about our power conditioners and protection systems. Power Supplies, Battery Chargers, UPS Systems, Lightning & Surge Protection, Power Factor Correction. Purpose designed IP66 LED Lighting system for the mining industry...24VDC,48VDC,240VAC, ELV, 5yr warranty. 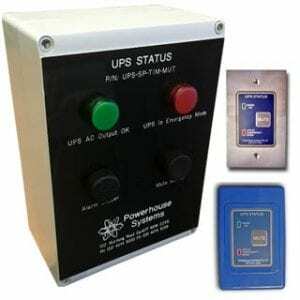 The R&D Technology UPS Status Indicator (UPSSI) has been specifically designed to provide remote indication of the UPS Status. Medical and Industrial versions available.